A young sleep paralysis sufferer is harassed by an ancient evil. According to Wikipedia, up to 50% of people suffer from sleep paralysis at any one time. It is a disorder generally thought to be caused by the sleeper waking before the body has had a chance to switch out of its natural 'paralysis' mode, which is designed to keep you still while you slumber. It's something people have pondered over and researched and studied and questioned for centuries. It's also pretty damn terrifying. Dead Awake is based on this phenomenon. We first meet poor strung out and sleep deprived Beth (Jocelin Donahue – The House of the Devil) arriving home after a harrowing night of sleep paralysis only to be unhappily surprised by a birthday party her boyfriend Evan (Jesse Bradford - Hackers) has decided to throw for her. Attending the party (among several friends) is estranged sister Kate (also played by Donahue) who immediately adopts a fraught sense of intimacy, which makes it clear that she is eager to move beyond whatever had previously come between them. After conversation turns to sharing of burdens, Beth reveals her sleep struggle and finds an unlikely support in Kate and reluctant friend Linda (Brea Grant), who point her to the sensible but dogged Doctor Sykes (Lori Petty) at the local sleep disorders clinic (are they really that common?). Here she is reassured that everything is perfectly normal; it's not actually a demon hag in her room (fun fact - sleep paralysis is also know as 'old hag syndrome') and if she can stay calm and move a small part of her body, that imagined hag won't strangle her to death in her sleep - huzzah! Of course, tragedy strikes leading sister Kate, accompanied by Evan and his very welcome humour, on her own search for answers with the mysterious Doctor Hassan (an alarming Jesse Borego) along for the ride. The premise is a good one; sleep paralysis is a terrifying concept in itself and the director (Phillip Guzman) doesn't need to try too hard to make this workable as a horror movie, as all the tools are there as long as he has a good cast and a decent script. Luckily this film has at least one of these elements in play and the other isn't too far behind. The cast all do a splendid job, from the abrasive but compelling vibe of Petty to the ‘why isn’t he in more things?’ Bradford; but the true stand out is Donahue. Playing twin parts in the same movie would always be a challenge, but she pulls it off with aplomb, imbuing each character with their own set of reactions, vocal patterns and mannerisms. The split screen effect never slips even once and is highly effective; bigger budget movies may have something to learn here. The script is a little scrappy at times, pulling together threads of a story that could do with more focus and direction, but it keeps you watching, and while there are some liberties taken (particularly within the medical and scientific ideas) it is just this side of the suspension of disbelief. The ending feels rushed and not especially well thought out but it's not a deal-breaker by any means. The concepts still work, even when some of the finer plot points waver. The main negative with this film is the decision to show ‘the hag’. It seems to me that if horror directors just studied the classics before they embarked on making their opus they would see the strengths of many of those films lie in restraint. A jerky unknown shadow crawling towards you as you lie in bed is infinitely more frightening then a fully illuminated hag, dubious make up and all, breathing into your face as she chokes you. 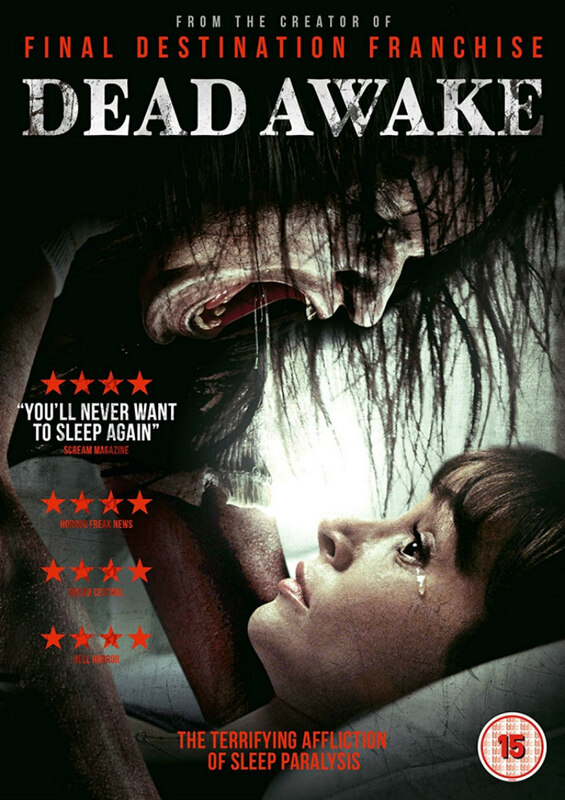 Dead Awake is available on UK DVD May 15th.